It Starts With Food might be one of the best diet books I have ever read. There are many great books filling the shelves at your local Barnes and Noble, but this one truly stands out from the rest. 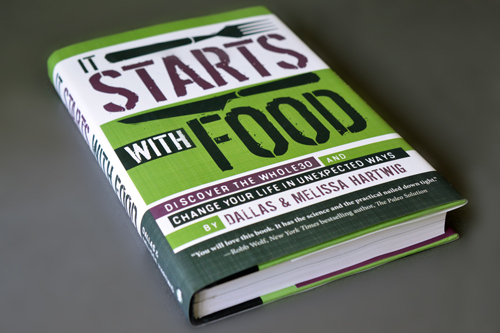 The authors Dallas and Melissa Hartwig of Whole 9 present food as the foundation of health, and I could not agree more. The authors cover health basics by discussing how food affects the brain, digestion, inflammation, and immunity. The science is presented in easy to understand language, which helps the reader truly grasp the message. Most importantly the authors show the connection between food and the body’s actual response. This leaves the reader feeling empowered. They can walk away and choose a food based on how they want their body to respond, either good or bad. It’s with that kind of knowledge that a person can then either choose to eat one way or the other. You guys, it really does start with food. To be honest, I rarely read non-fiction. It bores the heck out of me! But after I became interested in our Western diet + how it seems to be the root of many problems…I realized the only way I could truly be informed was to read non-fiction. Surprisingly, I find it really interesting. 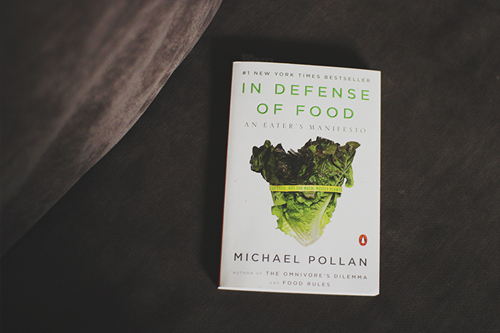 My current read is Michael Pollan’s In Defense of Food. The tagline reads: Eat Food. Not Too Much. Mostly Plants. So while I push for eating whole foods – I’m wondering how much longer those whole foods will exist. Gross. Have you read Animal, Vegetable, Miracle by Barbara Kingsolver? I think you both would love it! It’s what started me on my local, whole foods way of life. I (Mary) started the book back in Graduate school when I borrowed it from a friend. I never finished it though because I got so busy! I would really like to finish it! I think you would really enjoy it now! I read it 3 summers ago and my husband read In Defense of Food at the same time – totally unplanned! Those serendipitous choices changed our lives. I read It Starts with Food before embarking on my first (and definitely not last) Whole30. It brought up thought-provoking questions about why we eat the way we do (societal “we”), and I liked the focus on scientific and nutritional research. Further research I’ve done on my own about how our bodies process things like grains and soy have confirmed a lot of what ISWF talks about, but I like the Hartwigs’ readable book and actionable plan. We will consider that for sure! Sounds really fun! So glad you loved It Starts With Food. It really is thought provoking!